The lectionary readings for Epiphany explore how the world came to know Jesus: visitors from the East, voices and doves at his baptism, turning water into wine at a wedding, reading and interpreting scripture. These have been the gospel readings for the past weeks. The gospel reading for Epiphany 4C (Luke 4:21-30) continues the reading from 3C (Luke 4:14-21) where Jesus reads from the Isaiah scroll and announces that the scripture has been fulfilled in him. Verse 21 is the bridge verse, and in the 4C reading we see what happens when people do not accept words as God's truth. Jesus is marched out of town in preparation for being killed. Such a response might not have surprised Jeremiah, whose call is the focus of the Epiphany 4C reading from Hebrew scripture. In this reading Jeremiah is called to deliver the word of God to God's people. God's hand touches Jeremiah's mouth as a sign that God will provide the words Jeremiah is to say. to the human one, though Chagall has made one significant change. In the print, the hand that comes from heaven to inspire Jeremiah's words belongs to an angel rather than to God as the text says. 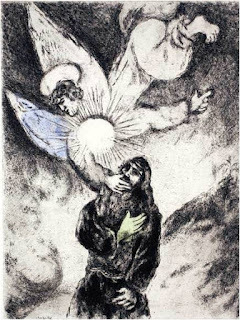 Perhaps this is Chagall's acknowledgement of the Second Commandment that prohibits images of God. 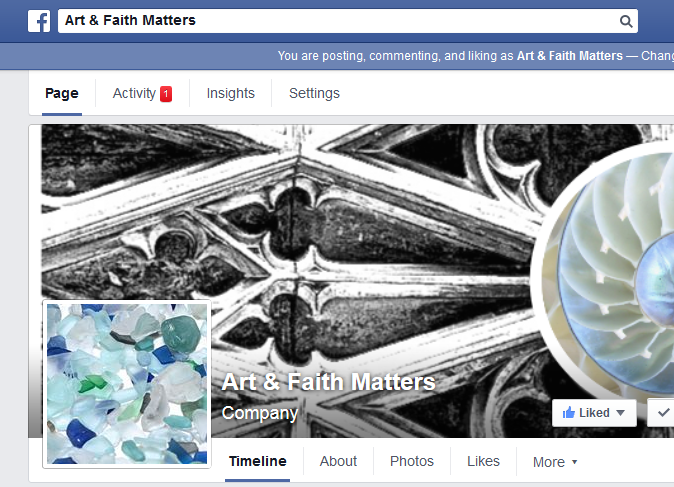 A bright circular disk or shield covers the angel's chest and emits rays, presumably of light. Angel or God, the being in the top half of the page is the focus of Jeremiah's gaze. The background is indistinct, and the angel is barefoot. And even as the angel's right hand touches Jeremiah's mouth, Jeremiah's right hand is over his heart in a gesture of loyalty or allegiance, perhaps. 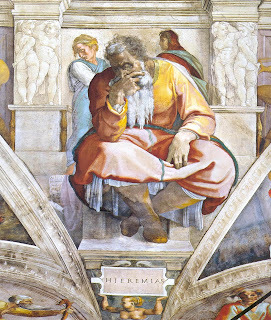 Centuries earlier, Michelangelo painted Jeremiah in an entirely different pose. The Renaissance Jeremiah appears more aged. No longer the young prophet at the beginning of his career, he sits rather than stands, looks down rather than up, and with his right hand covers his own mouth in a gesture that is not the potential sign of loyalty or allegiance from Chagall's work. Michelangelo Buonarotti. Prophet Jeremiah. Fresco. Sistine Chapel, Vatican. 1508-1512. How would you describe the gesture that Michelangelo gave to Jeremiah? Is he simply resting? Is he propping his head with his right hand? Is he despairing? Has he seen too much in his career? Is he trying to block the words God has put in his mouth from being spoken? In your own life, are you the young Jeremiah with God providing the words of your mouth? Or does the earlier portrait of the older prophet - who covers his own mouth - ring true to you? For additional thoughts on Luke 4:21-30, click here.